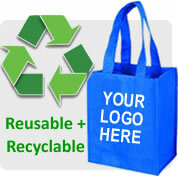 Durable and waterproof, our recyclable polyester and nylon bags are made for medium to long term usage. The strength and integrity of the material translates into a longer period of exposure for your brand and greater coverage. Printing options include silkscreen printing and heat-transfer.